If you have questions about betta care, you've come to the right place. Get the answers you need so you are prepared to give your pet the care he needs, including setting up the proper environment for him, feeding him the right foods and more. First, learn more about bettas themselves. Here are answers to the general questions most budding betta enthusiasts ask. How big can bettas grow? On average, male bettas grow to about two to three inches long, including their fins. Females tend to be smaller with shorter fins. In recent years "king" bettas have come on the market that have heavier bodies and range three to four inches long. What is an average lifespan for betta fish? 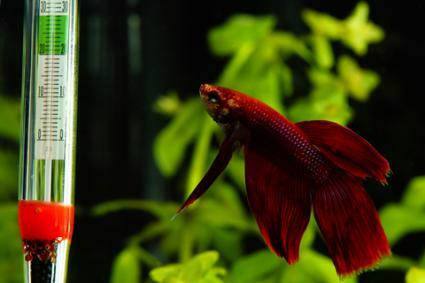 With the right environment and a good diet, betta fish generally live two to three years, but some have been known to live as long as five years. What should bettas be fed? Betta fish that live in the wild eat live food, mostly bugs. In captivity, bettas can eat pellets and flake food formulated for their species, and they should also receive fresh or frozen brine shrimp, as well as freeze-dried bloodworms and daphnia. Their stomachs are only as big as their eyes, so feed small amounts twice times a day, and rotate foods to offer complete nutrition. How can you tell if a betta fish is sick? How do betta fish live in the wild? Bettas live in shallow, slow-moving freshwater streams, ponds and rice patties of Southeastern Asia. Their diet consists of mosquitos, insect larvae, and plankton. Like captive bettas, males will protect their own territories and drive out other male intruders. Bettas are also known as a "labyrinth fish" which means they can breathe in oxygen by going to the surface of the water. They can even survive out of the water temporarily because they can process oxygen outside their watery environment. What can I do to improve my betta fish's lifespan? Do not keep him a small bowl despite the wide availability of such bowls for bettas. Look for a tank that is at least five gallons and that is wider than it is taller. Males must be kept separately but you can have more than one female in a tank, in which case you will need an even larger tank. Feed them using food made for bettas that has protein as a main ingredient. You can also add in bloodworms and brine shrimp. Do not overfeed your betta! You can give him a pinch of food once or twice a day. The amount should be how much he can eat in about one to two minutes (half that if feeding twice a day). Skip at least one day a week as well. The water in the tank must be filtered and kept at 78 to 80 degrees Fahrenheit. Make sure you condition their water with a conditioner made for bettas. This dechlorinates the water and removes other harmful chemicals. Keep live plants in their tank to help oxygenate the water and providing your fish with areas to hide and relax. Now learn how to select and maintain the right environment for your betta. This information will help your fish enjoy a higher quality of life. Which size tank is most appropriate for betta fish? While betta fish can live in those tiny bowls in a store, this is not an ideal situation. It works because they're alone and because they are able to breathe the surface air. However, water conditions can deteriorate quickly in such a small container, so each fish should live in a tank that holds at least one gallon of water, and preferably two to five gallons. This will give the fish plenty of room to move around in, and the overall environment will be more stable. Do betta fish need special equipment in their tank? Bettas have a gill system just like other fish such as goldfish and guppies, but they have an additional organ called a labyrinth that also enables them to breathe the oxygen in the air above the surface of the water. This is why they can live quite well in large bowls without air pumps and filtration systems, but it's still better if you can provide a fully working tank because this will help maintain better water quality between tank cleanings. Bettas like warm water, so a heater and thermometer are needed to keep the water at the right temperature. Caves and plants are also good additions to the tank so your betta has a place to hide, relax and even take a nap. What should the water pH and temperature range be? The ideal temperature range for bettas is 78 to 80 degrees Fahrenheit. These fish are a little hardier than some tropical fish, and they do well in a pH range between 6.5 and 7.0. Ammonia and nitrite levels should be kept at 0, and the nitrates under 20. You can buy a water testing kit that will help you determine the levels. How many betta fish can live in one tank? Male bettas are quite aggressive towards other bettas, especially other males, so you should only keep one male in each tank. Females can also be kept separately, but it is possible to keep three to five females together in a 10-gallon sorority tank as long as there are enough plants to offer hiding places and territorial divisions. Which other types of fish can I keep with my betta? Bettas can be kept with non-aggressive tropical fish of similar size that require the same temperature and pH ranges. Some examples include platies, mollies and swordtails. Bettas often view guppies as smaller male bettas, so avoid those as well as gouramis since both will provoke a betta's territorial instincts. The best procedure is to only introduce your betta to one new species at a time and see how well he reacts. 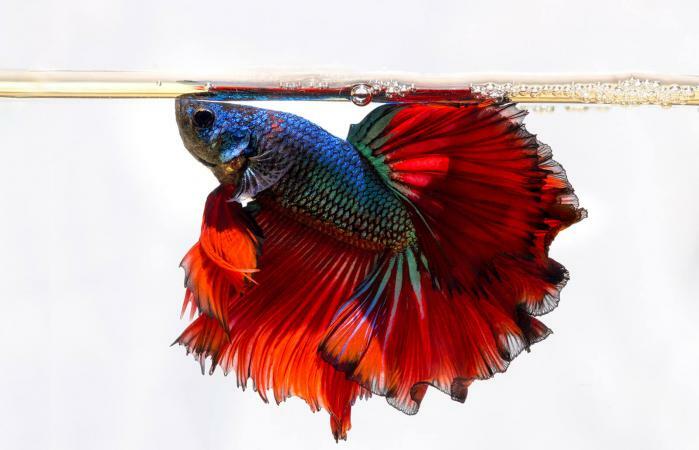 Betta fish need clean water, otherwise, they become stressed and susceptible to disease. One-gallon bowls and filtered tanks should get weekly cleanings and water changes to remove harmful toxins. However, not all the water should be changed at the same time. According to the vets at PetEducation.com, the old tank water contains beneficial bacteria that convert ammonia to nitrites which are then converted to nitrates that can be removed with partial water changes. Plan to remove and replace 25 percent of the old water with fresh, dechlorinated water. The fish droppings can be pulled out of the tank with a turkey baster. If you still want to own a betta after reading the answers to the most frequently asked questions, this is likely the fish for you. The knowledge you've gathered here will help you provide your pet with appropriate care from the moment you bring him home, and that means he'll have a longer and happier life with you.